If you’ve got little ones at home, you’ll know how stinking hard it is to entertain tiny children. We coordinate all the activities for them, we buy the toys, we play with them and try to teach them things. But at the end of the day, entertaining toddlers is a lot of work, and sometimes we need a little break. That’s where bathtime- and the best bath toys for toddlers!- come in. When the day is stretching on to infinity and beyond, we like to throw the kids in the tub for that last, long hour of the day. We fill up a wineglass and then fill up the bathtub, and throw ourselves what our dear friend Amanda likes to call Bathtime Happy Hour. From about 5 to 6 pm on one of the Daddies’ long work nights, you can find us setting up shop in the bathroom and letting the kids enjoy an extra long (and extra fun!) bathtime. It’s an excellent sensory experience, helps with to scientific and analytical thinking (we’re not even kidding! ), is a screen-free activity, and contributes to personal hygiene. Which makes it an extraordinarily easy thing to justify. And more importantly, it keeps them from driving us bonkers. 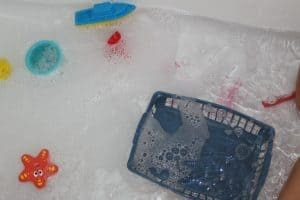 So if you’re looking to get a little more life out of your bathtime routine, we’ve collected the best bath toys for toddlers, along with some activities and add-ins to make your time in the tub a little more fun. You know we’re big fans of process art around here, and bath time is a great way to sneak in more art (without the mess!) These bath crayons are the perfect solution! We give the kids a color or two at a time (along with a washcloth to remove their “art” when they’re finished) and let them color the entire tub if they want. And yes, they DO remove very easily from the walls. I have my kids avoid the grout just in case, but even when they slip up it still comes off super easily. If your crayons are more stubborn, our favorite bath tub cleaning hack makes clean up a breeze. This small container of colorful bath drops holds a lot of fun for our kids! We let them each choose a color to drop into the tubs (we save the blue ones for potty training. Read why here). I typically use this trick on days when they don’t want to take a bath. It gives them a little extra incentive to get in the tub when they’re not in the mood. I even add a little color learning activity to it by asking them to name the colors they hold and see what color they make when we mix them together in the water. You can’t go wrong with a tub full of bubbles! My kids like to make beards, “paint,” and wash their toys with the bubbles. I typically just make bubbles by squirting a little shampoo into the tub as it fills, which creates a fair amount of suds. These are by far the very best bath toys for toddlers. Boon’s Building Bath Pipes tubes suction cup to the wall and allow kids to pour water into (and through) them. It basically turns your bath tub into a giant water table. I like that each one has a unique feature so that kids can cycle through all of them without getting bored. And as they get older, kids can create an elaborate water maze with the tubes. If they line them up right, water will cascade from one tube to the other until it lands back in the tub. 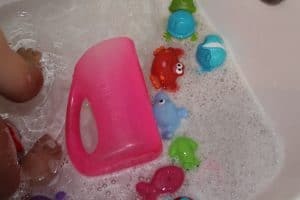 A side benefit of these bath toys for toddlers is that it contains their need to pour to one part of the tub (the back part) which keeps water off your floors. Hallelujah. We’ve got another fun bathtub art project for you! Hand your kids a paint brush and some easy to make “paint” and let them paint the walls. 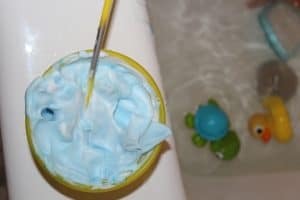 You can create bath safe paint by mixing shaving cream with a few drops of food coloring or washable paint, or follow our steps to create taste-safe yogurt paint. Don’t feel like mixing it yourself? 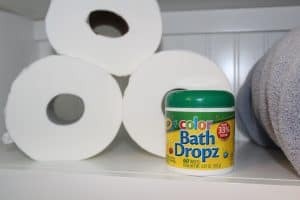 Grab a tube of Crayola’s Bath Paint soap on Amazon. Rubber bath toys are the most classic bath tub toy option, but it’s one of my least favorites. I’ve seen too many posts circulating around Facebook about the mold that grows inside to ever truly love them again. But my kids? They don’t care about bath toy urban legends. They want toys, and lots of them. I make myself feel better by buying a fresh set of bath toys every few months. If your bath toys for toddlers are getting old, consider this your friendly reminder to get some more. Grab them here before you forget! 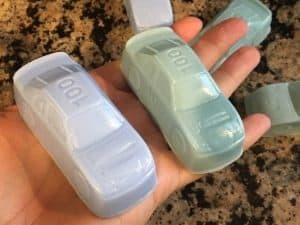 If you’re still feeling squeamish about throwing some rubber ducks in the tub, my friend Amanda has come up with a genius solution- soap in the form of a toy. You should also check out her toy-embedded soaps. So. Much. Fun. This one is pretty simple, but my kids can get very creative with this little basket from the Dollar Tree. Sometimes it’s a bed, sometimes it’s a boat, or sometimes they try to “catch” their bath toys like it’s a giant net. It also adds a unique way to pour and stream water, which the kids are big fans of. This is where the scientific learning can come in. Kids learn to scoop and pour (and even measure) by pouring water from one container into another. We have this little hair-washing pitcher that the kids use to pour, and this boat scooper as well. The cheapest way to change up your bath routine is by adding in some recycled materials. If you look around your house, I’m sure you’ll find that there’s actually a lot of plastic containers that are used to pour or squeeze. Instead of throwing them straight into the recycling bin, let them make a bath time appearance first! 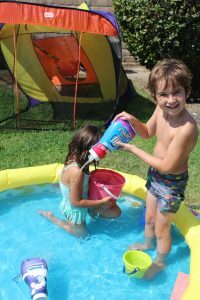 Laundry detergent, ketchup or salad dressing bottles, and even water or spray bottles can add a little extra fun to your bath time (or wading pool!) routine. Just make sure to rinse them thoroughly before handing them over to the kids! 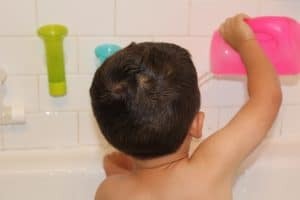 When we need to stretch our bath time routine a little longer, we come up with some pretty inventive bath toys for toddlers. A whisk can allow them to create even more bubbles in a sudsy tub, and some measuring cups and spoons allow for more scoop-and-pour fun. We also let them play “kitchen” in the bath (it’s like making mud pies, but SO much cleaner). We give them a few bowls (mixing and serving size), spoons, and maybe even a little pot or two. Then let them serve up some delicious “soup” (but DEFINITELY don’t eat it!). 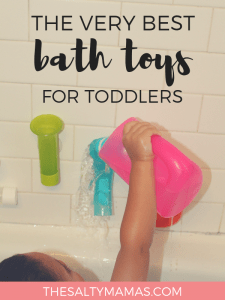 We think you’ll find that by using some of the best bath toys for toddlers, you’ll be able to extend the length of bath time quite a bit. 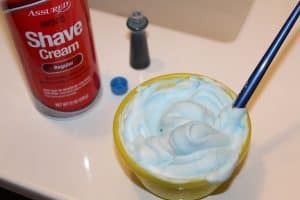 So if you need some extra hour to blow dry and style your hair once in a while, kill time at the end of a day, or even clean the bathroom, these hacks will give your bath time routine a little extra oomph. 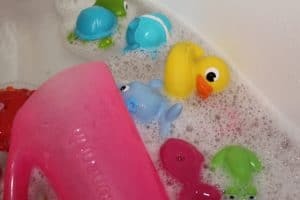 What are your kids’ favorite bath tub toys? Tell us in the comments, and you might even find that they make it onto our list! Looking for more fun kids’ activities to try? Previous Post: « How to Get Your Husband Off the Phone – Without Nagging!